Hard Drive Testing: Does it really work? Hard drive testing is certainly an important procedure which can protect you from losing your valuable files, documents, and tools. As a hard disk drive can lose functionality anytime, it is compulsory that you are aware of its health and performance to stay safe from any kind of loss. There are several factors which can cause the hard drive to malfunction for which a regular diagnosis can prove to be a great idea. Hard disk failure can happen without any notice and eventually, all of the stored information and data is automatically erased. To stay safe from any sort of inconvenience, make sure you are regularly using a hardware maintenance tool which will keep your hard disk healthy and free of errors. Why is hard drive testing important? In order to find, test and repair hard disk problems, conducting a routine test is recommended as it can help you in determining the overall health of the device. Operating systems are not programmed to deliver updates regarding hard disk health for which supporting tools need to be used. Each of the modern day hard disk drive is equipped with a built-in monitoring system known as the S.M.A.R.T (Self-Monitoring, Analysis and Reporting Technology) which can be used to judge the physical condition of the media. Although the smart tools are of no use if the HDD has malfunctioned but using it regularly to determine its life and health can save you from unwanted loss of data. Furthermore, this diagnostic tool can also tell users about the root cause of media failure or other factors such as power alterations which can bring damage in future. S.M.A.R.T tool also lets users get updated information regarding device temperature, read and write speeds and other essential factors to ensure best reliability and performance. CHKDSK tool is all about availing data about the performance and health situation of the hard disk. Along with checking benefits, the chkdsk windows utility can also be used for repairing bad sectors, directory errors and cross-linked files for which there are no extra procedures required. Although this tool does not deliver precise information as compared to S.M.A.R.T, it is only supposed to check whether the storage medium is working properly or not. To use the CHKDSK Tool, go to My Computer and right click on the drive which needs to be scanned. Afterward, click on properties and open the Tools tab to start with the procedure. Click Check Now button and the scanning will start automatically. If there are any bad sectors or malfunction points find in the hard disk drive, the tool will generate an analysis report which can be used to perform further diagnosis. Active Smart is one of the most popular and outperforming hard disk repair tool which is designed to deliver perfect results. As it can take care of the hard drive status, health and performance, the tool also regularly determines disk temperature and eliminates any bad sectors as well. Unlike conventional hard disk repair tools, Active SMART now features special algorithms to estimate failures and protect the storage medium from power failures as well. 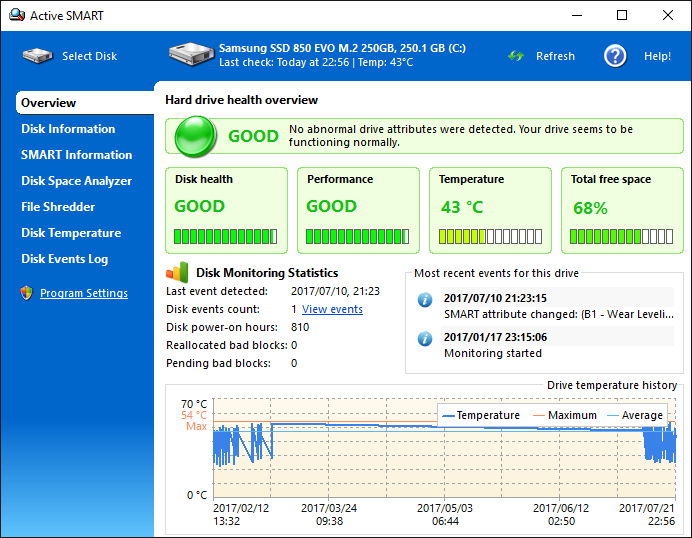 Along with a quick scanning of the HDD, Active SMART tool also utilizes the Disk Space Usage Analyzer to scan the medium and present a graphical overview of disk usage space as well. By using its amazing TreeMap technology, the tool delivers matchless hard drive testing benefits to its users. Whether you wish to check space utilization of files or clear unwanted data, there is nothing impossible for Active SMART. Active SMART is a multifunctional hard drive maintenance tool which keeps the hard disk drive healthy and prevents unwanted loss of data as well. The automatic disk checkup and monitor supports constant tracking which stops weaker machines from overheating and malfunctioning. In case the device becomes extremely hot, the tool with suspend computer operation and hibernate the PC immediately. This is all possible by the use of latest algorithms which keep your data safe and secure from unwanted attacks or malware. Once the tool has been installed on your PC, it will automatically retrieve the essential S.M.A.R.T information from hard drives and calculate failure possibilities as well. After the scan is complete, the user will be notified about the potential dangers and emergency situations without any delay. Regular care and maintenance of your PC can surely prevent major problems such as hard disk drive failure. Although there is no permanent solution available to prevent HDD failure or data loss determining the health and performance of storage media regularly can yield amazing benefits. Never wait until the last warning from S.M.A.R.T hard disk maintenance tool as it can eventually lead to an unrecoverable loss. Hard disks are never meant to be perfect and long lasting for which users are advised not to ignore scheduled maintenance and checkup. Obviously, electronic devices are never designed to retain functionality and durability forever, so make sure you have created a complete backup of your important files and data in advance. With a predefined backup, you can replace the damaged hard disk drive with a new one and restore the files without any hassle. So, if you have some really important stuff on your computer which needs to be protected at any cost, never rely on your HDD and create a backup in advance. The Hard disk drive is the main driving force behind the seamless performance and efficiency of your computer. With the increasing number of HDD protection tools available online, selecting the one best suitable for your computer can keep your important data safe and secure at all times. Being absolutely easy to operate, the Active Smart tool prevents the storage medium from overheating and malfunctioning as well. By regular scanning and evaluation, you can simply determine the health and performance of your hard disk in order to prevent unwanted failure. So, if you never want to lose your precious data and retain the performance of your PC, a routine hard drive diagnosis can prove to be a great idea.